Yes, candy corn was purchased solely in support of the photo shoot. 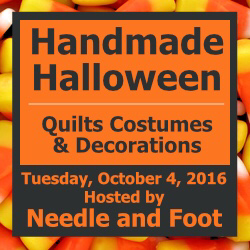 Bernie @ Needle and Foot is hosting a Handmade Halloween linkup party. Check out all the tutorials and great Halloween ideas. Since my kids have grown long beyond the desire to trick or treat, there are no costumes to make (!!!). This leaves plenty of time for other fun sewing. This mini storage bag is (roughly) 4" x 2" x 3 1/2'' and goes together quickly and you easily modify the dimensions to get a bigger bag. The tutorial for my mini bags will take you through the steps to create one in just a few easy steps. The tutorial was first published as part of my 2015 Elm Street Quilts Bag It event. This is about as easy of a bag as you can possibly make! 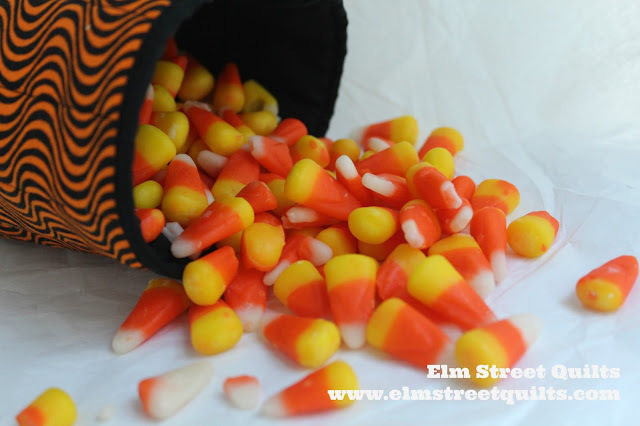 And the now we are in the midst of the Elm Street Quilts 2016 Bag It event! If you are new to the blog and the Bag It event, take a moment to read through the main event page. Basically, there are new tutorials each week for all different kinds of bags. Make and share a bag - ANY bag from ANYbody's tutorial or pattern - and earn entries into the giveaway of just fantastic prizes.